Ceramic Coatings are the most durable and long lasting form of protection for various surfaces throughout your vehicle. Ceramic Coatings completely eliminate the need to wax your vehicle and allow for extreme ease of maintenance, providing the ultimate long-term value. Our paint coatings provide the ultimate protection against various damaging elements such as harsh ultraviolet rays, bird droppings, dirt, tar, and even graffiti. We also offer durable ceramic coatings for leather, fabric, plastic, and glass surfaces. Ceramic Coatings provide the ultimate protection for your investment. Our shop has been specifically trained and certified to apply Ceramic Pro Coatings. Why? We have tested many industry leading coatings and have found that Ceramic Pro is unmatched in terms of overall protection, durability, and ease of maintenance. Ceramic Pro is also verified through Carfax, which adds value to your vehicle. 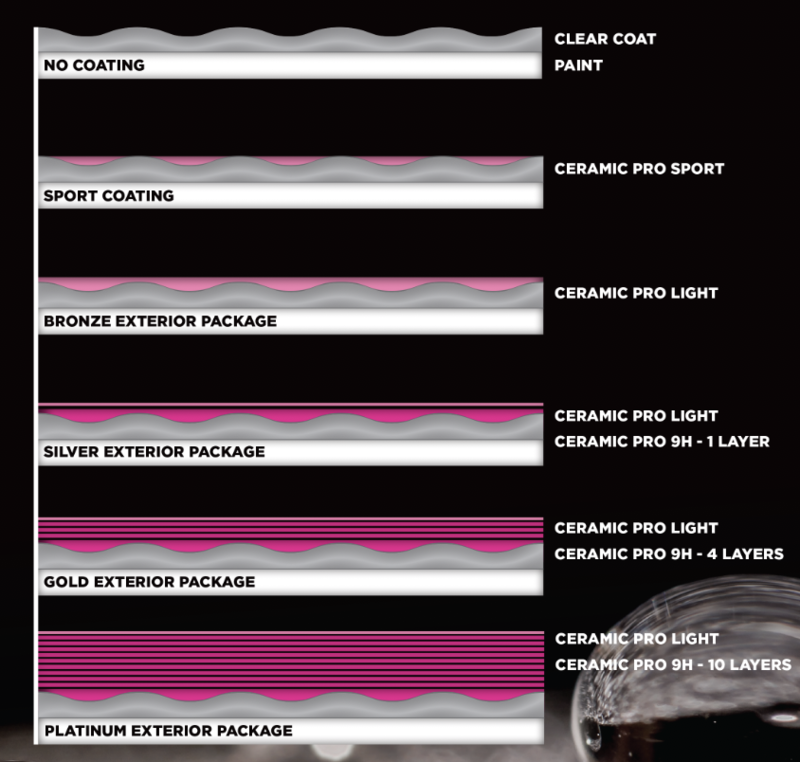 Our goal is to provide the highest value to our clients – with Ceramic Pro, we make that possible. Ceramic Pro is a liquid nano-ceramic coating that is applied to surfaces inch-by-inch. The coating physically bonds to clear coat on a microscopic level, creating a durable protective barrier. The coating fills in microscopic pores in the clear coat, making the surface extremely glossy, smooth, and hydrophobic. When the coating is fully cured, it can be described as a second clear coat for your vehicle, providing the ultimate sacrificial barrier against the elements. Due to the extreme bonding of the coating, Ceramic Pro can only be removed with heavy abrasion such as wetsanding, compounding, and polishing, further emphasizing the extreme hardness and protective properties of the coating. Wax is a liquid or paste that is naturally derived from the carnauba palm plant. Although it may briefly add great gloss to your paint, wax is a natural substance and WILL NOT withstand the heat of the sun, especially in Arizona. In fact, the protective properties of wax are compromised at 120-130 degrees Fahrenheit. Therefore, we do not recommend using wax as a protectant. Synthetic Sealants are man made protectants which can be applied in a spray or liquid form. Sealants are specifically engineered to withstand ultraviolet radiation and will not melt away up to certain levels of heat. Like wax, synthetic sealants add gloss and hydrophobic properties to your paint but offer a higher level of protection. We use synthetic sealants as our base form of protection. A ceramic coating is a nano-ceramic liquid that is applied onto a surface inch by inch. Unlike waxes and sealants, which sit on top of the clear coat, ceramic coatings physically bond to the clear coat on a microscopic level, creating an extremely smooth surface, ultimately providing extreme ease of maintenance. Ultraviolet inhibitors in the coating provide the best protection against the damaging sun.